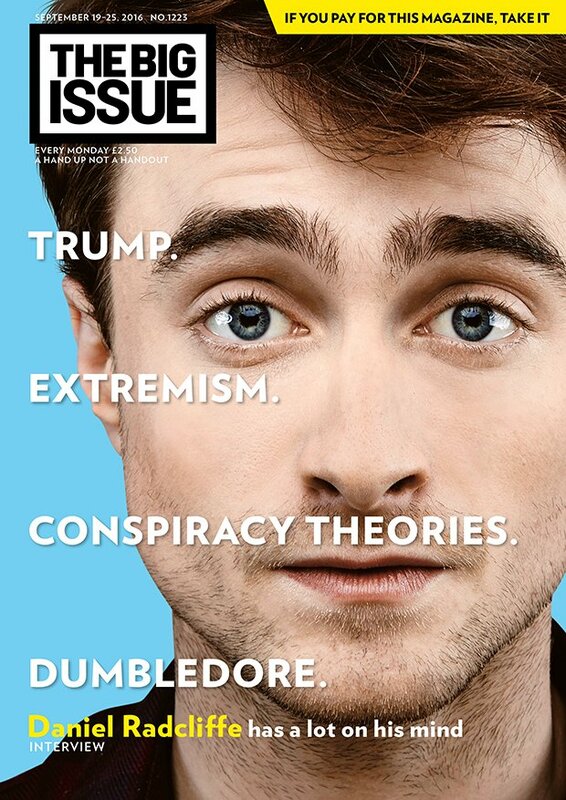 Daniel was on the cover of last weeks The Big Issue (UK). Below the interview in promotion of Swiss Army Man (in UK cinemas this Friday) and Imperium (now playing and on demand). The photo on the cover is by Julien Weber. Is it satisfying as an actor to have two films coming out that are so completely different to each other? I often get more credit than I deserve for picking diverse projects. I feel like every actor wants and tries to do that. I think because I played the one character for so long people notice it more with me. But yeah – it’s definitely nice to have two projects that are so wildly different both in terms of tone and in terms of what I’m doing in them. I feel like a lot more actors would have wanted to play a corpse if they’d read this script and seen how imaginative and crazy and brilliant it was. Swiss Army Man for me is what I would call a uniquely cinematic film. That story, you couldn’t do that on stage, you wouldn’t be able to capture it in a book – that’s what’s so exciting about it. Do you pick projects that allow you to act rather than just allowing you to be a movie star? Making massive big-budget films isn’t necessarily an easier thing to do; in fact, they’re a lot harder to make well because so many people are involved. It just so happens that the scripts that have most excited me and interested me over the last year or so have been these smaller indies. A girl asked me once at a fan Q&A, why do you pick such weird projects? They’re not weird to me. I think one of the joys of film is you don’t have to be completely true to life. Speaking of true to life – or true to death – I’ve seen pictures of you and your stunt-double dummy together (below). So do you still keep in touch? I’ve not got him. I probably should have looked out where it was going or who was going to end up keeping it. I assume it’s with the head of our makeup department, Jason Hamer, but I don’t know. Maybe he’s eBayed it. I’m sure there are potentially loads of Dan Radcliffe body mould collectors. Oh, I hope not. On Potter I definitely had my head done, my arm done, I think I had my feet done – I definitely had my whole body done at least twice. They are somewhere in the world. Nick Dudman, who was the prosthetics chief on Potter, probably has access to a warehouse-full of moulds of all of us. It will form the basis of the next big exhibition they have. God, that would be funny. Does playing a corpse make you think about your own mortality? It does, although it makes you think about death in a very specific and weird way. In a fun way. I feel like Manny’s quite a cheerful dead guy, which implies that being dead maybe isn’t so bad after all. If there wasn’t any death, life would go on forever and get incredibly dull and it wouldn’t be special. We’ve all just been taught to think that it’s a very scary thing – but it’s got to happen. 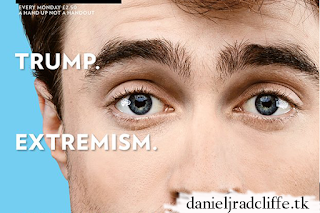 Imperium [trailer below] explores the frightening rise in intolerance leading to extremism. Is this something you notice in the world around you? I see it everywhere at the moment. There is an ugly trend of blaming the unfamiliar and whatever’s foreign in both Britain and America – I’m not saying that’s where Britain and America are, but I think that’s where a lot of people are in those countries. What research did you do into the white supremacist movement? Did you begin to understand what attracts people to these groups? Imagine if you’ve lost your job, your wife has left you and somebody comes up to you and says: “Actually you didn’t lose your job because you’re crap and your wife didn’t leave you because she doesn’t love you any more – it’s all a gigantic conspiracy against us as white people.” Their worldview becomes incredibly simple and nothing is complicated any more. We all like conspiracy theories though. When you spoke to The Big Issue last year you said your favourite was that Donald Trump was running a false flag campaign to help Hillary Clinton get into the White House. Still my favourite conspiracy, still hope it’s super true! But I’m getting less sure of its truth. Sometimes he [Trump] does look like a man who is trying to sabotage himself because of some of the things he comes out with. All those moments – you must know you’re screwing up by saying that! But now it’s become scarier because his new handlers seem to have got him on-script a bit more. That’s slightly terrifying. Imperium shows that the real threat is not from overseas terrorism but from domestic extremists. There is definitely a propensity by certain people in America and over here to push the idea that terrorism only comes from one group of people, which is obviously untrue. No matter how many times there will be wonderfully articulate Muslim scholars on TV talking about the fact that they are obviously not represented by [terrorists], there are groups of people who are trying to make terrorism and Islam synonymous. The film starts with a quote: “Words build bridges into unexplored regions,” which was said by Hitler. But is the word ‘terrorism’, and the fear it evokes, the most powerful weapon there could be? I think so, to a certain extent. It’s also a method of control, particularly if you can control what words come to mean. It is scary when you start to see it, particularly in America at the moment, watching some of Trump’s speeches, which are designed to make people hate and fear other people. It’s viscerally upsetting. But at the same time, as Dumbledore says: “Words are, in my not-so-humble opinion, our most inexhaustible source of magic.” So hopefully there is also the potential for positivity too. Yes, absolutely. Completely. Definitely. Nice quote.